Malawi President Arthur Peter Mutharika on Friday left the country to attend the 2018 Commonwealth Heads of Government (CHOGM) meeting, where 53 heads of state and government will attend the summit. The Summit will be held from16 to 20 April, 2018. On his departing statement, aired on the state-owned MBC after reviewing a guard of honour mounted by the Second Battalion of the Malawi Defence Force (MDF), at Kamuzu International Airport, President Mutharika highlighted his reason for personally attending the CHOGAM despite austerity measures being followed by the government. “The meeting is very significant in the sense that we will be discussing very important issues such as malaria control, development and also issues of education, health [and] security. So, it is extremely important,” he said. The President said he could not delegate the assignments to his ministers. He then boarded the chartered plane and took off. The Vice President Rt. Honorable Dr. Saulos Kalus Chilima dismissed the guard of honour in the company of Army Commander, General Griffin Supuni and acting Inspector General of Police Rodney Jose. At the already colorful happening, a normal occurrence when the president leaves the country or attends an event, drama ensued, as questions were asked and not answered about who will be at the helm of the country in the President’s absence. This question comes after the mainstream media and social media were awash with reports of former First Lady Callista Mutharika’s remarks about the 2019 presidential elections. In her remarks, the former First Lady said that President Mutharika (who is her brother in-law) should pave the way for his Vice President, the Rt. 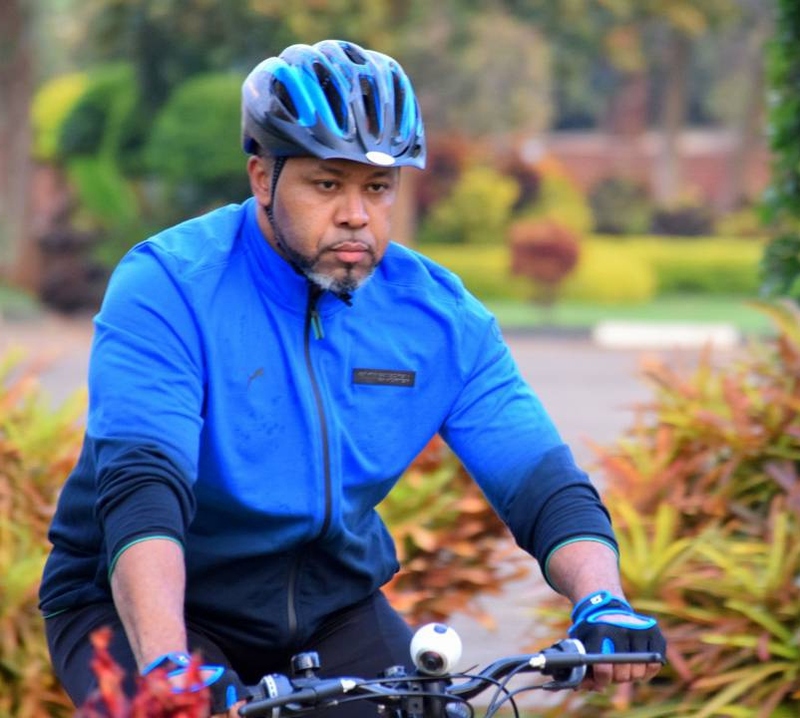 Honorable Dr. Saulos Chilima as the DPP presidential candidate in next year’s elections. Following this, DPP National Youth Director Louis George Ngalande and Mulanje South MP Bon Kalindo and a traditional authority joined the fray and made calls for Chilima to step up to the challenge of contesting for the DPP contender. But honorable Info Minister, after the Presidential plane left, it was the Vice President Chilima, flanked by General Supuni Phiri and Jose, who then stood in front of MDF soldiers and took the salute of command. Chilima then proceeded to his official MG 2. This person being saluted, aka Dr. Chilima, is the person President Mutharika has left in charge of Malawi and its 17 million Malawians. Chilima dismissed the guard of honor in his capacity as Acting President of the Republic of Malawi. Section 89 of the Constitution states that in the absence of the President, the Vice President discharges the duties of the President. In their misguided euphoria, immediately Acting President Chilima got into his car, a group of DPP youths mobbed the car, and started singing in support of him. This is quite a great tribute of support; one that could easily distract a person who is easily swayed by hero-worshippers. Ever since the former First Lady’s statement that outright named and supports the Acting President, for the 2019 elections other groups have come out of the closet and support the VP for President. The joke is surely on these supporters, because in fact Chilima is the Acting President and shall remain with this title until the return of President Mutharika. As some may ask who is in charge and others chant “Chilima for President,” they insult themselves. It was Acting President Chilima who dismissed the guard of honor, escorted by the Army Commander General Supuni, in the same way President Mutharika was escorted around the guard of honor before he left the country for the CHOGAM meeting. The Army Commander accorded Chilima the same honor and respect he accorded President Mutharika; additionally, General Supuni’s soldiers saluted Chilima as he left the podium. And the supporters of “Chilima DPP 2019 presidential candidate,” expect His Honor, the Acting President Chilima of the Republic of Malawi, to thank his lucky stars, speak up, accept the offer to lead them in 2019 elections on the DPP ticket, and step down from his acting presidential seat. You expect him to hear your request for him to speak up. You “Chilima supporters,” have people gone completely out of their minds? Dr. Chilima is already President, in an acting capacity, but he is closer to being president that the “2019 rainbow chasing” being proposed by the supporters. Today, Chilima is the president of Malawi. The same old Mutharika left the baby Chilima in charge, to preside over Malawi. Tis is as prescribed by the constitution. As you chant your campaign rhetoric, His Honor Dr. Saulos Klaus Chilima is eating in the same plate with Mutharika as the second citizen. With Mutharika out of the country, His Honor is Acting President. In his prudence, Vice President Chilima is definitely extending his loyalty and reaping the benefits. Apart from being loyal, he is also confident and patient. Lastly, the Malawi Constitution gives people the right to freedom of speech; although it is silent on the right to freedom not to speak, Chilima is within his rights in not to speaking on the so-called Chilima for president supporters; especially on an issue that risks him being removed from his constitutional right to assume in the now period, the role of Acting President (with the right to perform all the duties of the president in the said president’s absence). If Chilima speaks, he could risk that right of passage to what ensued on Friday and every other time the president is out of the country: the right to ascend to the role of president in an acting capacity. To top it all, Chilima is a God-fearing man, and his stoic stature reminds me of David and his troubled relationship with Saul. I salute you Bwana Acting President Dr. Saulos Klaus Chilima!